A few weeks ago, John B and I were monitoring last spring’s planting in Forest/Kama Paddocks. When we had finished, lacking a bottle of champagne, we broke out our thermoses of tea and coffee. As we sat, looking west toward the glorious view of the Brindabellas, we noticed three birds sitting in a big dead tree not far away in the next paddock. John (much better at bird ID than I am) said “that’s a Kestrel and that’s a Black-faced Cuckoo-shrike”. I said, “no, no, that isn’t a kestrel, it’s not big enough!” Well, it turned out, after I checked my bird book when I got home, that the kestrel is actually smaller than the Black-faced Cuckoo-shrike. Who knew? The other bird, after considerable discussion and further observation through the binoculars, proved to be an Olive-backed Oriole. A week or so ago, on a Thursday, Bob H and I were weeding at the Pinnacle, and as we trekked up the Central Track we saw a freshwater turtle (aka tortoise, but I am told by a herpetologist that freshwater turtle is the currently accepted term). It was being harassed by several Australian Ravens, who just knew there was something edible in there but couldn’t get to it. Sensibly keeping its appendages inside its shell, the turtle was uninjured. Bob H and I rescued it and placed it at an ephemeral drainage line away from the track. The Ravens gave up in disgust and disappointment. Towards the end of the weeding exercise, I was distracted by some lovely small flowering plants I hadn’t seen before, in a swampy area. With the assistance of my plant book and our fotpin plant person, Rosemary, I identified it as Golden Weathergrass (Hypoxis hygometrica) with brilliant yellow six-petalled flowers and grass-like leaves. I also saw a delicate blue five-petalled flower which I haven’t been able to identify as yet. The following Saturday I took my visiting brother in law out to the Pinnacle for a walk. 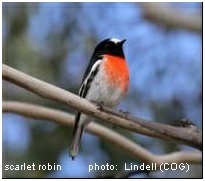 We sat on the edge of the Macrorhyncha Track for our morning tea and had an absolutely splendid view of bird activity: Grey Fantail aerobatics; Yellow-rumped Thornbills flocking and feeding; and a special treat, a male Scarlet Robin (Petroica boodang) came and sat in a patch of sunlight on the track about a metre and a half away which gave us a great chance to observe his gorgeous plumage. As well, I was mobbed by butterflies.